Located right at the base of the River Run Gondola, the Timbers is one of two buildings that you can ski right up to the front door. Private ski runs lead directly to and from the Timbers so you don't have to walk anywhere. Furnishings / Features: Furnished to the hilt with all top end items, The Timbers at Keystone is where you'll want to be. The lobby and lounge area of the Timbers is on par with what you'll find at any high end property in Aspen or Snowmass with a bar, piano, huge fireplace, and more. Kitchen - Fully equipped with stainless steel appliances and granite counter tops. The kitchen is efficient and fully equipped if you wish to cook a whole meal. But, since you're in River Run, you might as well go out to eat at some of the world class dining in the area. Dining Area - A table and chairs is just off to the side of the living room and close to the kitchen. Seating space for 4. Living Room - Decked out with a huge 32" TV, massive fireplace, leather chair and Queen sofa sleeper, the living room is Keystone Colorado at its best. Balcony - A private balcony with log chairs has views of tall pine trees and the mountains to the North. While this particular condo does not overlook the slopes, you'll enjoy the peace and quiet on this side of the building. The ski slope is a very noisy place with loud music and the sound of scraping skis well into the night. Extra Sleeping Quarters - Just off to the side is a fold down Queen size murphy bed for extra sleeping capacity. There is also closet space for those extra people and a bathroom so everyone isn't waiting. Bedroom - The Master Bedroom is a huge room featuring a King bed, attached bath, and flat screen LCD TV right there in the room. View of tall timbers and to the mountains on the North side of Keystone are abundant. 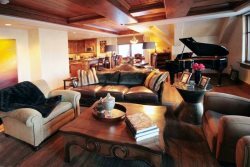 Ski-in Ski-out - Located right next to the River Run Gondola, the Timbers is as good as it gets in Ski-in / Ski-out luxury lodging. Tucked back just far enough that you don't have to listen to the loud music or scraping of skis on the snow. Outdoor Pool and Hot Tub - The indoor entry pool dips underneath a glass wall so that you can enter the pool from the inside, yet swim outside into the cool mountain air if you like. A fully heated deck keeps your feet from getting too cold as well. The outdoor hot tub offers a stunning natural waterfall from the side of the mountain. Luxury Lounge and Bar - The lobby is pure luxury inside and out. Leather furniture, a grand piano, plenty of seating, and a massive rock fireplace are the first things you see when you walk in. The decor and feeling of the lobby is right there on par with the big resorts like Aspen and Snowmass. A large bar is located in the lobby if you wish to host a private get together and share stories of the slopes with close friends. Heated Driveway - Big snowstorm and concerned about getting to your condo? No worries. The Timbers and Lone Eagle are nestled back on Trail Head Drive, which is a fully heated street where no snow or frost will stick at all. Heated Parking - Underneath the building is a heated garage so you don't have to scrape any snow off during your stay. Clearance is 8 feet....so even if you drive a bigger SUV, you'll definitely fit....even with skis on top. Close to River Run Village - Just 200 yards to the shops and restaurants of River Run Village. Enjoy a drink after dinner and be back to your condo in just a minute or two. Private Courtyard - The private courtyard where the pool and hot tub are located also features a gas fireplace to keep everyone warm during a cold winter. Perfect for gatherings and kids, the fireplace is located right next to the hot tub. Also in the area is a sauna, steam room, and workout facility. Towels are supplied so you don't have to use your room towels.